It doesn't even hold true in Texas. The only child of I-20 is I-820, the only child of I-35 is I-635, the only child of I-45 is I-345, and there are I-410 and I-610 but no I-210. It holds if you postulate future routes in other cities, such as 210 in El Paso and 145 in Houston. In light of FHWA's recent decision that the I-69W designation for the Laredo-to-George West prong complies with the HPC 20 "I-69" designation language, perhaps it's not too late to redesignate I-369 as I-69N in order to give Texarkana a 2di suffixed I-69 and remove any controversy over an odd first digit 3di vs. even first digit 3di. Actually, it is inconsistent for the application of an even or odd first digit when the interstate spur in question connects two different mainline interstates. I've always interpreted FHWA guidance on 3di numbering to where an auxiliary interstate that "connects Interstate routes" can have an even prefix (so I-476 PA or I-271 OH would be valid). Though we have so much variability because of different state (and AASHTO or regional BPR office) interpretations, as well as cases where a state simply ran out of prefix's (namely CA and NY). During Working Group meeting 5 on November 18, 2014, it was concluded that concerns about the northern and southern tie-in points, moving east, and the No Action Alternative would be considered in any future environmental studies. Additionally, the Working Group was in agreement that going west through the mining areas would be difficult because of ground settlement, making it the least suitable location to construct a roadway. It was also reiterated that moving the route option farther east may pose a financial strain on the City of Marshall to provide utility services for future development. Subsequent to Working Group meeting 5, it was further recommended that the existing US 59/ Loop 390 intersection be included as the potential northern tie-in point interchange and be included in the future environmental studies. The Working Group members concurred to carry their Interstate route option preliminary recommendation (Figure 5) forward as a final recommendation to TxDOT to be studied in detail as part of the environmental process, should the project progress. Road hands from around Northeast Texas gathered March 2nd to celebrate the completion of a major milestone in the development of Toll 49 -- a new highway that will eventually be a connector to the Interstate 69 System in Texas. By late March a 10.2-mile section connecting to Interstate 20 in western Smith County will be open to traffic, allowing motorists safer, faster access to points around the south side of Tyler. Tolls from the project will eventually be used to extend the connector to the northeast around Longview and then east to connect with US 59/Future I-69 on the north side of Marshall in Harrison County. The long-range plan calls for Toll 49 to cover more the 100 miles. A total of 26 miles of the highway have been completed so far. TxDOT has posted a more detailed map of the preliminary recommendation that includes interchange schematics and the location of a potential interchange with Toll 49. 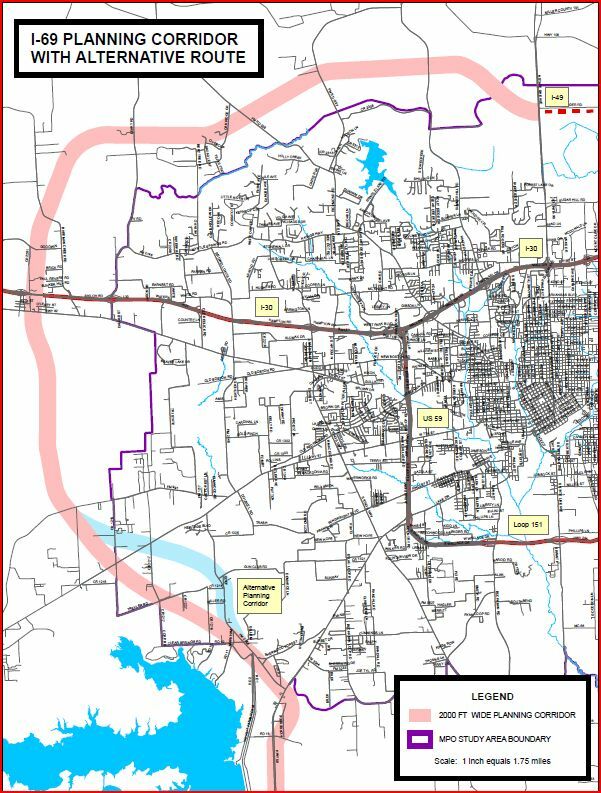 Highway planners for a 12-county area approved $2.6 million in spending Tuesday for the next section of the East Texas Hourglass and looked favorably on a proposal to avoid oilfields. “This is, we think, a much better fit — a much more realistic fit for Segments 7 and 8,” Everett Owen told trustees of the North East Texas Regional Mobility Authority. The mobility authority’s executive director was describing segments of the East Texas Hourglass that one day could take drivers from U.S. 271, on an east-west route midway between Longview and Gilmer, to U.S. 59 north of Marshall. “It’s an east-west corridor that I think is important enough that it will be well-traveled,” Gregg County representative Dave Spurrier said as he walked trustees along the proposed Hourglass route. The Hourglass project is envisioned, in part, as a tolled shortcut for traffic from Arkansas, ideally along the planned Interstate 69 , to reach I-20 west of Tyler, and vice versa. It will extend off Tyler’s Toll 49 Loop and be funded from its tolls. 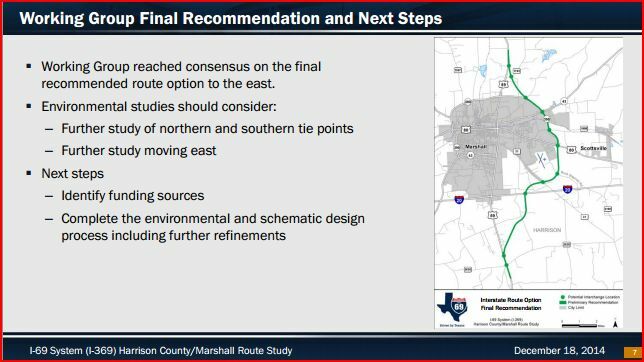 However, it seems like the I-369 Marshall relief route set forth in the preliminary recommendation would provide a relativey easy shunpike opportunity. Ever since seeing the initial plan maps for this, I'm still at a loss. They act like TX 31 and I-20 are invisible and there's no other way to get from Tyler to Longview to Marshall. 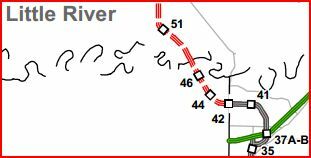 The RMA should just finish Loop 49 like what was in the original plans, no wasteful funny business. And you're right--there's ALL KINDS of shunpike-ness (including what becomes of I-369) that can be had in east TX without giving the RMA a dime. I've never been on Loop 49, and don't need to, either. This is certainly a baby step, but I believe it will be the first non-Texarkana, post-I-369 corridor designation, and interstate-grade upgrade, section upon completion. 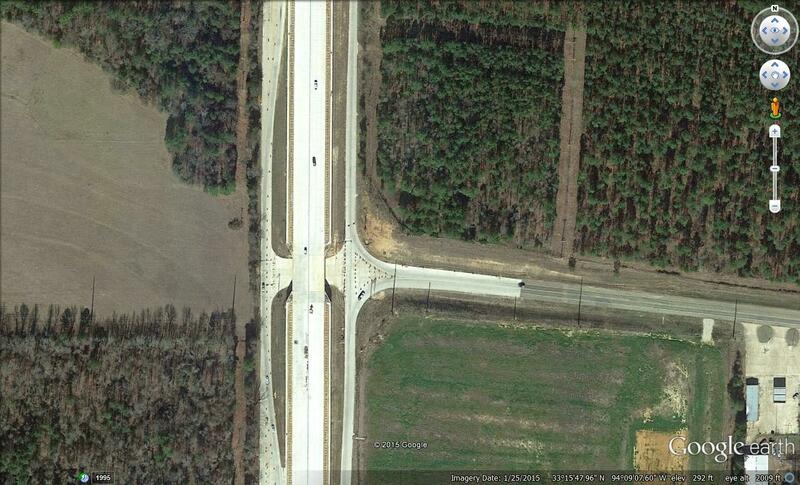 Google Maps has now updated its imagery (which includes a labelled U.S. 59 Frontage Road), as well. ^I know exactly where that is. That's going to be the exit used by residents of the town of Domino/International Paper employees. I wonder will this be the last exit on future I-369 before the road veers off and heads toward I-30? Three regional planning groups in East Texas have joined in a resolution supporting the work of the I-69 System (I-369) Harrison County/Marshall Working Group. 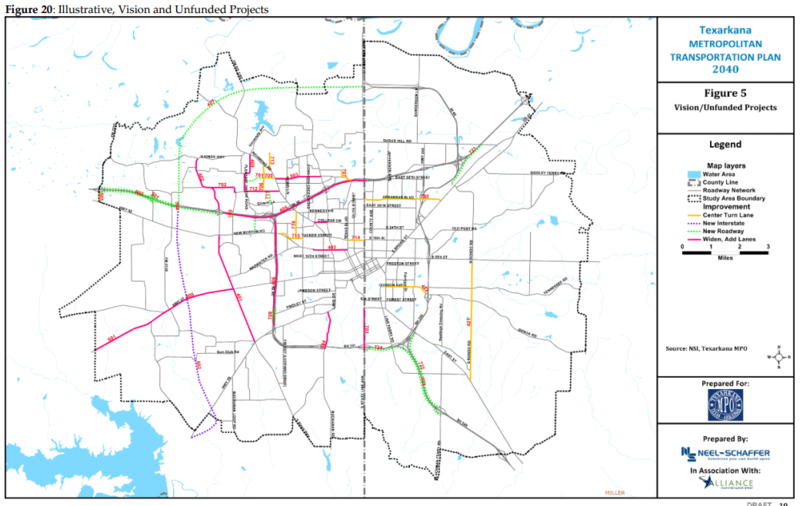 The Working Group has been seeking citizen consensus on potential routes for Interstate 369 to flow through or around the city of Marshall and to interconnect with Interstate 20 which runs east-west at the city’s southern edge. The next steps in the project will be for TxDOT to identify funding sources and complete the environmental and schematic design process. the US 59/ Future I-369 main lane overpass construction (and associated frontage road work) at FM 3129 in Cass County .... I believe it will be the first non-Texarkana, post-I-369 corridor designation, and interstate-grade upgrade, section upon completion. That's going to be the exit used by residents of the town of Domino/International Paper employees. I wonder will this be the last exit on future I-369 before the road veers off and heads toward I-30? Recent discussion about I-369 in another thread discussed, among other things, a possible "new" western routing for I-369 in the vicinity of Texarkana, a possible I-49/ I-369 interchange north of Texarkana, and how development north of the current I-369 northern terminus would make a connection to I-49 from that point unlikely at best. The discussion also reminded me of the above question. The short answer is that we don't even know for sure that there will be a new terrain western route of I-369 from some point north of the Sulphur River bridge to I-30 near TexAmericas Center. Two of the three I-369 priorities have progressed: I-369 has been designated and signed along part of the Texarkana Loop, and a working group has developed a recommended corridor for the Marshall relief route. No similar apparent progress has been made regarding the Texarkana relief route. Since it has been identified as a "priority", progress towards identifying the corridor and achieving a solution with the neighborhoods might be made in the relatively near future. At least the Northern Loop is on the radar, even though it is not a priority. Above said, a second short answer to the above question is that it is time to hurry up and wait. Here is the proposed logging of the entire I-49 corridor in Arkansas (and Texas). Please understand this is all PROPOSED and is subject to a tweak every now and then. I assume that Exit 44 in the above snip of the Texas I-49 exit numbers will be the eventual I-369/ I-49 interchange location; it provides a good visual approximation of the I-369/ I-49 interchange location in mileage terms. Maybe the Texarkana Loop should have been numbered Interstate 230. In any event, it will likely be a long time before Interstate 369 is completed. The Hourglass project is envisioned, in part, as a tolled shortcut for traffic from Arkansas, ideally along the planned Interstate 69 , to reach I-20 west of Tyler, and vice versa. It will extend off Tylers Toll 49 Loop and be funded from its tolls. 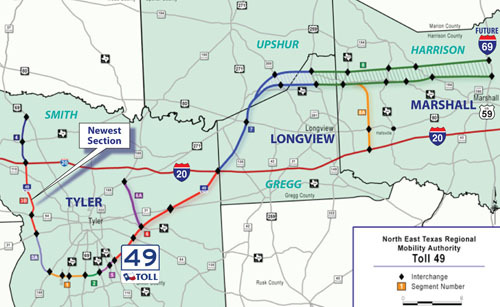 Tolls from Loop 49, which in recent years reached Interstate 20 just west of U.S. 69, are dedicated to pushing the loop's first extension into what planners eventually hope to be a multi-county connector. "It's going great," North East Texas Regional Mobility Authority Executive Director Everett Owen said Friday. "The (toll) revenue is up. It's been building 15 percent every year, month-to-month. That's allowed us to move along faster than we expected." The so-called East Texas Hourglass, a proposed extension of Loop 49, is drawn up to eventually encircle Tyler and link Smith, Upshur, Gregg and Harrison counties in a sweeping, part-toll highway concluding at U.S. 59 north of Marshall. For more information and to view a map of the proposal, visit www.netrma.org/east-texas-hourglass. The proposal would not put a toll on existing roadways. It has greater implications, with U.S. 59 slated as the East Texas portion of the planned Interstate 69, drawn to run from South Texas to the Canadian border at Lansing, Michigan. The mobility authority is swinging the Hourglass' next leg north from Toll 49's dead-end at I-20 to U.S. 69 north of Lindale. Environmental studies for that stretch were completed in April, Owen said. Meanwhile, the money to pay for that leg, which is Segment 4 on the Hourglass, appears to be flowing in from completed sections of Toll 49. An increasing number of drivers are taking the toll loop from the southeast side of Tyler, south around the city and north to the I-20 end point, a mobility authority study from April shows. Segment 4 is expected to cost $34.2 million. Love’s Truck Stop has purchased the land on U.S. 59 and FM 3129 in Domino, Texas that TXK Today previously reported would be the home of a new Love’s. As we previously reported the land was cleared in the summer of 2014 for a new Love’s Truck Stop. Loves closed on the property within the previous week. According to a preliminary site plan Loves plans on building a 10,000 square foot facility on the 15 acre site. There will be parking for 75 vehicles and 84 trucks. The site will also have truck scales and a tire shop. No word from Loves on when building is set to start. Interstate 369 should not have been signed in Texarkana until the road at least connected with the yet-to-be-built segment in Tenaha. After a quick scan of the document, I could not find a direct reference to either the West Loop or the Northern Loop. The tentative western, new terrain I-369 routing is within the MPO boundary, which I believe the MPO felt obligated to do for this purpose. I suspect the eventual route will be closer to the corridor previously studied in the map from the above-quoted August 4, 2015 post. That said, at least that corridor and the northwest loop are included in the map. 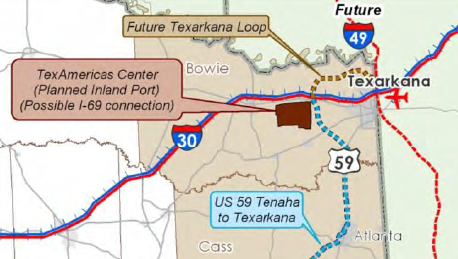 Also, the map does not reflect any intention to upgrade the US 59 corridor from where the new terrain western routing leaves US 59 to the current US 59/ I-369 section of the Texarkana Loop. I suspect that, if and when the new terrain western routing is built, the present-day I-369 will either be decommissioned as an interstate or redesignated (along with TX 151 and AR 151) as an even first-digit I-x30 or I-x49. Hmmm.....so, they wouldn't consider upgrading US 59 between where the Western Loop would veer off and the existing US 59/TX 151/AR 151 freeway? That would be unfortunate, since that could potentially create a nice southern bypass connection between I-369, I-49, and I-30...not to mention, provide a direct freeway connection into the heart of Texarkana. Maybe a parallel freeway connection between there and where AR 151 bends as a compromise?? Will any more of Interstate 369 be constructed in the near future? I don't think they should have signed that orphaned section in Texarkana. Google Earth has posted January 25, 2015 imagery of the US 59/ Future I-369 main lane overpass construction (and associated frontage road work) at FM 3129 in Cass County ....Google Maps has now updated its imagery (which includes a labelled U.S. 59 Frontage Road), as well. Will any more of Interstate 369 be constructed in the near future? In comparing the January 3-9 TxDOT roadwork report to the week of March 13 TxDOT roadwork report, it appears that the concrete overlay work, as well as the interchange, have been completed. Incremental construction progress, but construction progress nonetheless. With the lake & neighborhoods as obstacles, I wonder if they will ultimately consider routing the I-69 Spur eastward south of Texarkana & approach AHTD about an interchange with I-49 in Arkansas south of the Texarkana Loop? Bowie County commissioners listened to a presentation from the Waco-based Patillo, Brown and Hill auditing firm Monday regarding the county's 2015 annual financial report. In other business, commissioners approved plans to apply for state grant money, which will pay for a study on a preliminary plan to have the Interstate 30 and Interstate 369 West Loop interchange run closer to the TexAmericas Center. This could include a possible frontage roadway access to the center. Scott Norton, TexAmericas Center executive director and chief executive officer, said the study will likely cost between $75,000 and $100,000, but he added the center will contribute a 50 percent match to the grant. The West Loop dream is still alive. But will it remain a dream, or will it actually be constructed eventually? As mentioned in the I-69 in TX thread, TxDOT has posted a 73 page March 2016 I-69 Implementation Strategy Report that provides the current status of each I-69 project in Texas, including I-369. Sifting through it all, it seems that a West Loop relief route will not be included in an Implementation Strategy Report as a priority until if and when a Working Group recommends a routing (as has been done in Marshall). I think they should have left it "Future Interstate 369" until the route actually connected with Interstate 69. Then again, it will probably be decades before that happens. 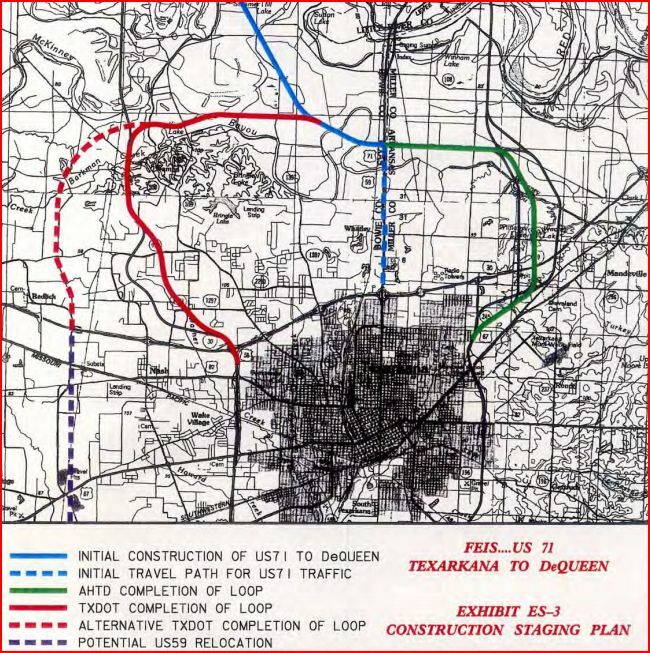 Could it be possible that they might do both a West Loop AND a full upgrade of US 59 to Loop 151? That would make for a nice connection to the future Tex-Americas Center AND a good direct bypass to I-30 East via Loop 151 and I-49. To restate your question, could it be possible to have an I-369W and an I-369E, with each having its own terminus at I-49, and the current I-369 redesignated as I-369C, with its termini at I-30 and I-369E? What state would do something silly like have three suffixed prongs? Seriously, with enough money, it could be possible.